We’ve had this argument several times, and she still refuses to see my side of the story. I think she’s blinded by my obviously superior arguments. Lindy Hop is an African American dance that evolved in New York City in the late 1920s and early 1930s. It was an organic fusion of many dances that preceded it or were popular during its development, but was predominantly based on jazz, tap, breakaway and charleston. 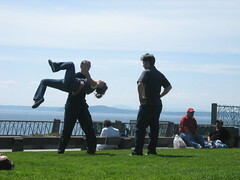 Lindy hop co-evolved with jazz music and is a member of the swing dance family. It is frequently described as a jazz or street dance. Dancing has been, for the last few years, practically all of the physically demanding activity that I’ve done. I’ve hardly done anything else. I’ve played basketball a few times, gone on a few hikes, but mostly I’ve sat in front of a computer and gone dancing. Had it not been for dancing I doubt I’d have been able to make it across the field even once. Of course, had I not been dancing all the time maybe I’d have gone out and done other things. Sorry, dancing is NOT an athletic sport; therefore, you should NOT use it as a form of exercise. I am may be blinded by many things; however, your argument, which is hardly superior, is not one of them. It’s okay Ryan, not everyone is made to be an athlete. I’m sure there are other things in life well suited for you… like taking me to Sconecutter :). Ultimate is still awesome! Everyone should play - regardless of their athletic ability! naanananaa!! I can’t hear you! Ryan June 7, 2007 at 5:23 PM hmmm…. crap, I say that all the time to girls. Is that really such a bad thing? Beth June 12, 2007 at 1:55 PM Probably not. But what is the definition of “dude” in general? I should look it up. I bet it implies a male person. :D I think it’s ok though. As long as she didn’t mind.